I was looking forward to today and the start of Northern Connect which would finally save me having to change buses at Derriford for work. 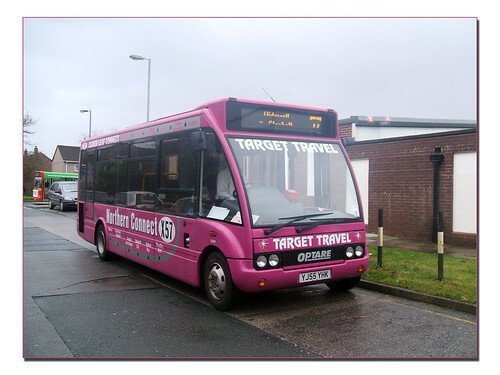 I was at my usual bus stop by 07:30 and was happy to see a pink Solo turn into Asda as it ran in the other direction. I was disappointed though in that nothing came the other way so it was the usual Citybus 52 to Derriford and then changed onto another Citybus for the final part of the run. During the day I kept an eye out for the buses and only saw one or two go past the estate. Not looking good! The City Councils own bus site where you can see the next bus due at any stop was only showing a journey at 16:25 - and this was still lunch time! After a bit of detective work I did come across a timetable on Traveline - which is not exactly the easiest system to use. It only shows about 5 journeys a day - a lot less than the regular service I was expecting. I decided to try and catch one of the runs that was timetabled and kept an eye out for the bus as it ran down towards Crownhill. Sure enough just a few minutes late it went through so I left the office and waited for five minutes and sure enough it turned up. I was the only passenger for this run but was told that they had been picking up a few passengers on earlier runs. I am sure this will pick up once people get used to it. I am sure many let it go by today without realising they could have caught it. I enquired about the 'missing' journeys and discovered that they are being covered by Taxifast so I need to keep any eye out for these tomorrow rather than the pink solos. I have yet to see one myself though they are out there somewhere! There was actually a two man crew on this bus as the driver was route learning so I got to chat to the trainer who asked if I was the one behind Plymothian Transit! Apparently he has appeared on a couple of my photos both with Target and other companies has has driven for. I cant remember your name - but thanks for the information! Hopefully tomorrow will see a report on the Taxifast side of this operation.